The all-new Audi RS 5 Coupe has made its world debut at the 2017 Geneva Motor Show nearly after two years since the older model's production was stopped. 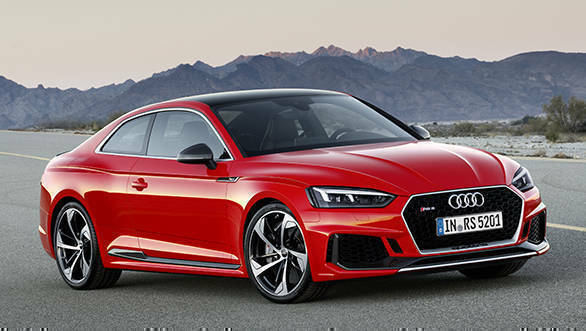 This is the first car to sport the new Audi RS design language, and Audi says that the car's designers drew inspiration from the Audi 90 quattro IMSA GTO. The front of the Audi RS 5 is characterised by the massive air inlets and grille constructed with the honeycomb design structure usually seen on Audi's RS models. The RS 5 sports LED DRLs which look similar to that of the Audi TT, and available as an option will be Audi's Matrix LED headlights. Audi RS models always have had an aggressive look, which is enhanced on the new RS 5 with the large, flared wheel arches widened by 15mm. The RS 5 comes with 19-inch alloy wheels as standard, while 20-incher will be available as an option. The rear end of the car sports a typical Audi design albeit with an aggressive lower half with the diffuser unit designed to house the massive oval exhaust outlets. Also available as an option is a carbon roof with a visible fibre structure, and enhancing customisation options will be gloss black, carbon and matt aluminium packages. The RS theme continues on the interiors of the Audi RS 5 too, as RS logos adorn the seats, steering wheel, door sill trims and the gear selector lever. Carbon-fibre inserts are found on the dashboard, door panels and centre console, and the sport seats also feature optional diamond stitching on Nappa leather. The steering wheel is a chunky, flat-bottomed RS multifunction sport steering wheel. RS displays in the Audi virtual cockpit provide information on tyre pressure, torque, g-forces and other vehicle settings. 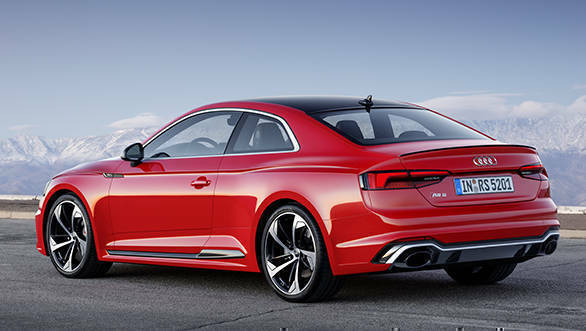 The RS 5 coupe is powered by a brand-new petrol engine, which according to Audi, has been developed from the ground-up. The 2.9-litre bi-turbo V6 engine produces an output of 450PS and 600Nm - 170Nm more than its predecessor. The run to 100kmph from a standstill is said to take 3.9s and top speed is claimed to be 281kmph when equipped with the optional dynamic package. An 8-speed Tiptronic gearbox transfers the power to the all-wheel drive system which is then distributed to the axles in a 40:60 ratio, with a bias towards the rear. 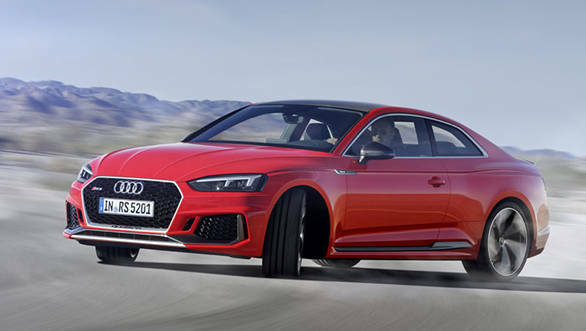 The RS 5 also offers the RS sport suspension with Dynamic Ride Control (DRC), ceramic brakes, RS sport exhaust system and dynamic steering with RS-specific tuning, all as optional. Weighing in at 1,655kg, the new RS 5 is 60kg lighter compared to the older RS 5, and at 4,723mm, it also measures 74mm longer than the older model. Audi will begin to take international orders for the RS 5 from May while deliveries are expected to begin only by June. Expect the car to be launched in India sometime next year.